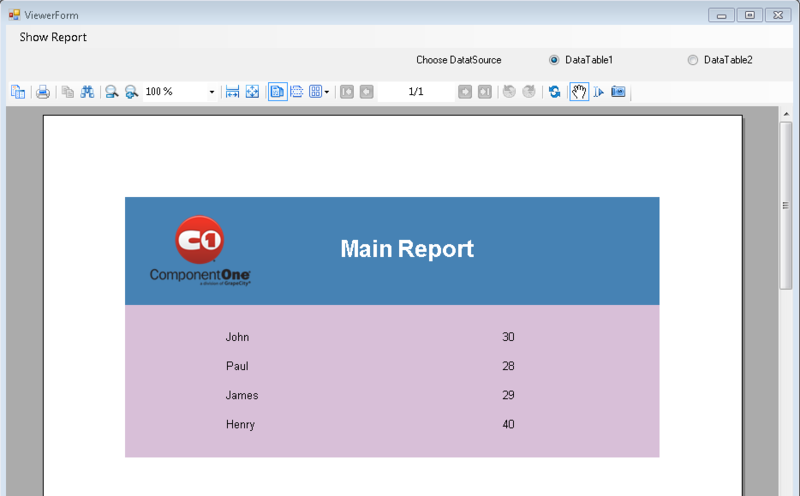 ActiveReports 9 offers two different kinds of Section Based Reports. One is Code Based Report and the other is XML Based Report. The difference between the two is the code behind file which is associated with the former. The XML Based Report is basically an RPX file which contains the report layout and any script associated with the report. Though both report types have their own advantages, the XML based reports may be handy in some cases like you can make updates to the RPX files and redistribute them without recompiling & redistributing the assembly. Since the XML Based Report does not have any code behind, it uses its Script section to handle any associated functionality using script. However there might be instances where we would want to use RPX files as Subreports and also set the datasource dynamically at runtime. It is quite clear that we would need to use Scripts to accomplish this task. But since scripts do not have access to any external classes, how shall we go about achieving the desired results? Well this blog topic tries to present an example which should clear things up. If you haven't heard of this term before, I would suggest you to take a look at this blog article which specifically targets this topic. This method adds an object to the script's global namespace. This further allows scripts to become aware of custom classes contained within a project. The sample which we are going to create in this blog creates subreports using XML based reports and allow users to switch between different datasources at runtime. The final output will look like the image below. So that is all we need to do. For a working example, please use the download link provided below.